Cleaning your windows is a regular part of making your home look its best. 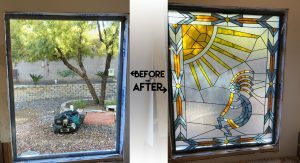 While you might have a winning formula that keeps the windows on your Phoenix home spotlessly clean, these same cleaning strategies might not be the best for your custom stained glass windows from Entry Brite. Before you hose down your custom windows with Windex, read our quick blog on how to clean your stained glass. After making so many custom stained glass windows for so many years, we’ve developed a sense of how to best care for your stained glass. Regular glass windows need water and soap, but for the most part, your stained glass windows usually don’t need these things. In fact, when you first notice that your stained glass windows are looking a little grungy, you should start by wiping them down with a clean, dry cloth. Microfiber is ideal, as it doesn’t abrade the surface of the glass. 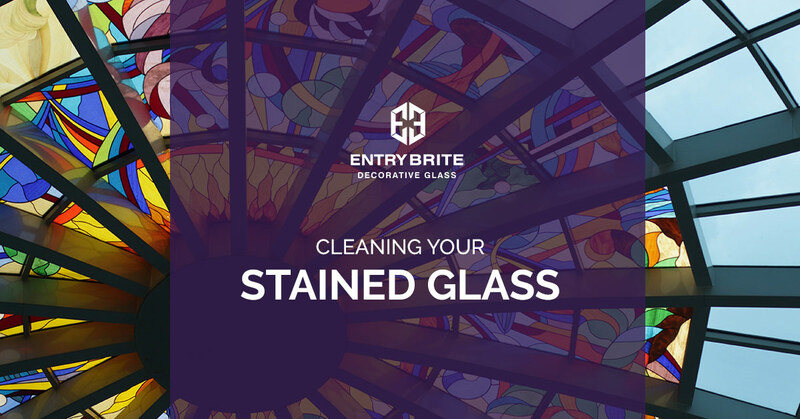 If your stained glass window is still not shining as brightly as you’d like after a gentle wipe down, it’s time to move on to a more detailed cleaning process. When choosing supplies to clean your stained glass windows, avoid using common chemical cleaners. Instead, use naturally gentle cleaners. You can use distilled water and any dish liquid that doesn’t use ammonia, vinegar, or any other abrasives. Rubbing alcohol can be used in limited quantities for particularly stubborn spots. Mix a small amount of the cleaner into a bowl full of the distilled water and keep a microfiber cloth handy. By starting at the top of the window, any cleaning solution that drips out of each section of the glass can be easily wiped up at the end of your cleaning process. We also suggest you work section by section, individually cleaning the glass within the lead frame. Be firm but gentle as you wipe down the glass, as you do not want to weaken the glass panel attachment to the lead frame. To clean particularly small glass panels, or very fine features, use a cotton swab dipped in your cleaning solution. This can also be done to do spot treatments on larger panels of glass. Make sure to use a cotton swab to run along the edges of the lead frame. It’s impressive how much dirt and dust build up on the thin edges of the lead. Cleaning these will add to the windows overall appearance of cleanliness. After you’ve cleaned every panel from top to bottom, you can wipe down the entire window with a soft, dry cloth. This will absorb any remaining moisture. After the window has dried, you can take another clean, dry microfiber cloth and gently wipe down each panel. And voila! You have beautiful, bright stained glass windows once again! Ready to add more custom windows to your Phoenix home? Be sure to contact Entry Brite and ask about our custom-made stained glass windows.